Sour cream — 1 tbsp. l.
1. Cut each fillet into 2 pieces, I salt, sprinkle with black pepper and a hammer slugger. It is better to beat the fillets under the cling film. 2. Now prepare the stuffing for mushrooms. For this I wash mushrooms in water and cut into medium-sized pieces of them. Onions is cleaned and I cut into small cubes. Then, in the hot pan pour oil and shift it sliced ​​onions and mushrooms. Fried mushrooms for about 10 minutes and turn off. 3. Now I wrap the mushroom filling in the broken-off layers of chicken. To do this, take a chop on the edge put a tablespoon of the mushroom stuffing. Then gently wrap a layer of meat stuffed into a tube. In order to keep the shape of rolls with further hot, I was bandaging their thread. 4. Instead of a filament can be used wooden skewers. Then I crumble rolls in breadcrumbs. I pre-fried pieces of bread yesterday in the oven and then cut them. So I made homemade biscuits. 5. Prepared chicken rolls fried in vegetable oil until golden brown on one and the other. 6. Then pour into a pan of sour cream and a little water, cover with a lid and the carcass until cooked 30 minutes. Rolls can bake until cooked in the oven. To do this you need to put down the fried rolls in a baking dish and pour cream. Cook in the oven at 200 ° C 35-40 minutes. 7. Chicken and mushroom filling provide great taste. 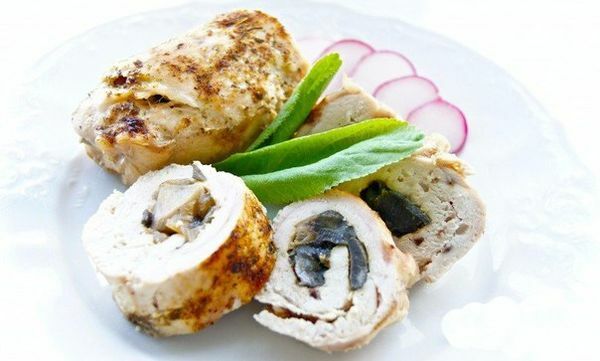 Ready chicken rolls can be served with different garnish. I like to make rolls of chicken sandwiches.